A few small changes to the line-up tonight as the Sens get set to host the Montreal Canadiens at 7:30 p.m.
We provided an update on Kyle Turris yesterday and nothing seems to be much different today. Turris, who rejoined the Sens for practice on the weekend, will miss his third consecutive game as he continues to recover from a viral infection. As a result, Max McCormick boomerangs back from Belleville after spending the weekend with the Senators' AHL affiliate but isn't expected to draw into the line-up tonight. Tweet from @Senators: The coach confirms that the #Sens will go with 11 forwards & 7 defencemen tonight. Turris (viral infection) and McCormick won���t play. It's an 11 & 7 game for the Sens tonight which means that Chris Wideman will return to action after sitting out Friday's game with a stiff neck. Wideman exited Thursday's game after a hit from Flyers forward Radko Gudas along the boards but appears to have the green light for tonight. As Friday's game progressed, DiDomenico and Pyatt swapped places for large parts of the third period in New Jersey. The in-game adjustment obviously worked as DiDomenico notched his first career NHL goal in the final minute to force overtime so that could be another thing to watch for tonight. Sens head coach Guy Boucher is pretty notorious for throwing our projected line-ups out the window atfer the first 5 minutes so expect that to happen again versus the Canadiens as well. 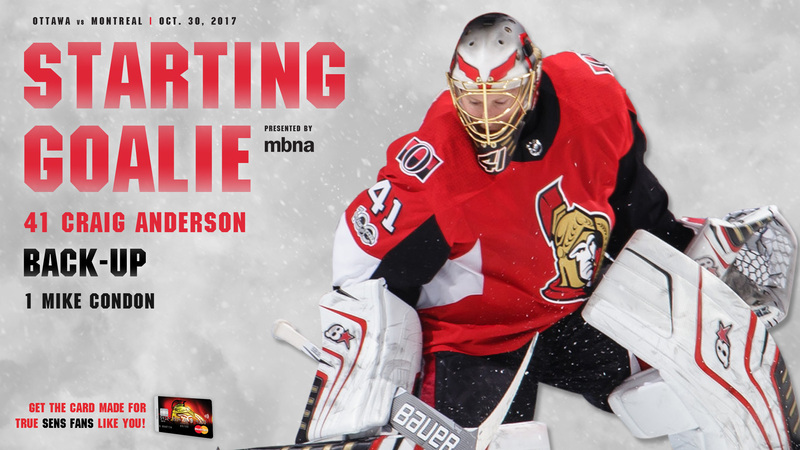 Craig Anderson (4-1-3) gets the nod in net for the Senators tonight. Anderson has a life-time record of 10-9-3 against the Canadiens in his career which I honestly thought would be a little higher but, as it turns out, he saves his best against Montreal for the post-season where he sports a ludicrous .960 SV%, a 1.43 GAA and a 6-3-1 record.